Granted, much of perfumery is indeed an applied art, “un art d’agrément” as we would say in French – “an art of pleasure” – whose meaning goes no further than to be pleasing: but then, the same goes for an overwhelming number of paintings, musical compositions and films. Does that deter us from considering those fields as art? And granted, perfume is meant to be worn, like clothing. But clothing actually has at least three functional uses: to protect the body from the elements, to conform to a given culture’s standards of decency, and to mark social status. To which a fourth, relatively more recent function could be added: the expression of personality. Perfume doesn’t fulfill the two first functions. It could be argued that two of its historical, practical uses – to ward off the noxious miasma thought to carry diseases, and to cover up personal or external stench – still persist in current usage, if only subconsciously (although today, to some people, perfume is thought to cause disease). But it can’t really be said that it has the practical use (protection, decency) of clothing. Perfume is purely ornamental and essentially useless – which is, of course, why the perfume industry is so mortally afraid of negative campaigning on the alleged noxiousness of its materials. Its very use is a conspicuous waste of money, since, unlike clothing, it cannot be cleaned, mended and worn until it falls apart. Of course, this ornamental function as a social status marker or as an expression of personality is far from sufficient to qualify it as art: if it were, a Vuitton bag or a snakeskin jacket would also qualify. In this sense, the score would be to music what the formula is to perfume. But who are the performers of perfume? Perfume needs four things to exist, apart from the liquid in the bottle. A body to bear it. Air to carry it. Noses to perceive it. Brains to transform it (into impressions and language). And this is where Octavian’s recent post on perfume as social art made the penny drop for me. In it, he refers to the curator, art critic and theoretician Nicolas Bourriaud’s 1998 Relational Aesthetics. In a very tiny nutshell, this theory applies to art in the age of the Internet: the main idea is that a “family” of contemporary artworks doesn’t posit the traditional dual relationship of the work with a single viewer; that because of its very structure (loosely, that of an “installation” or “performance”), it generates social relationships between its viewers, and that these social relationships are an intrinsic, essential part of the work. It isn’t complete without them; it goes on evolving as it generates interaction, discourse, use (for a slightly more detailed explanation of Relational Art, click here for the Wikipedia entry). Now, Nicolas Bourriaud happens to be an old friend of mine. I’d lost touch with him during his tenure at the Tate Modern in London, and started my blogging in the interval. When I saw Nicolas again, I of course spoke about my efforts. He was extremely responsive and enthusiastic: to him, this was “an extension of the field of criticism”. I haven’t broached the subject of relational aesthetics as applied to perfume with him, but Octavian’s post seemed to make perfect sense. Perfume does create social relationships and always has, if only on a subconscious level: it clearly impacts the way we present ourselves to the world and the way we are perceived by the people who smell our sillage. But it goes further than that. Perfume has also created a set of vibrant social relationships, facilitated by broadband internet connections and online publishing media (forums and blogs). It has been re-appropriated and hijacked (again, the French word “détourner”, “to deviate from an intended destination”, is more fruitful) away from the owners of the discourse: perfumers, PR and marketing departments, beauty editors, professional journals. Beyond the way skin “chemistry” affects its development, every new review or comment transforms its perception, its definition and the story that surrounds it. Its very nature, either as the intransitive, immanent creation of a great mind or as a consumer product, has been irreversibly altered by the newly thriving perfume culture. The very argument that “perfume can’t be subjected to criticism because its perception is essentially subjective” is thereby defeated. Subjectivity is part of the process by which perfume is appropriated as a work of art, by which it generates community and accomplishes itself through this community’s discourse— through the unending virtual extension of its properties and of its effects. By the way, this doesn’t contradict what I wrote in the previous post about the more objective criteria of perfume criticism: those criteria are as applicable to perfume as they would be to any creative endeavor, but they are just one element of the dynamics of the wider-ranging relational sphere of the perfume-loving community. The topic of conversation is already found for my next dinner with Nicolas. 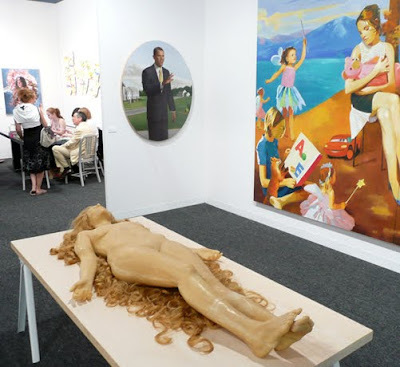 Image: Blond Figure Lying by Vanessa Beecroft, Deitch Gallery at the Art Basel Miami Faire 2008. Is status so important when it comes to perfumery? To me Feminite du Bois is a masterpiece in perfumery, a true classic but not Art. After all Serge Lutens defines himself as a "artisan" perfumer and rejects the idea of him being an "artist". Vivienne Westwood also shares a similar point of view and decries today's trivial art scenes and artist's ego. Franck Sorbier's latest fashion show (saw it on cable) proves he is definitely a talented couturier but too absorbed in his own artistic thoughts. He even sells couture paintings that are totally disconnected from conventional fashion because he wants to express himself beyond couture. Is Haute couture about artistic "messages" or out of this world designs and quality? I expect quality, originality and uniqueness. A la Nuit defines who I am as an individual, sublimates my identity just as Lutens intended it to be but nothing more. I'm a consumer, I don't want to be the an artist's spokesperson. My point here is that it isn't only the perfume composition in itself that achieves artistic status, but the effects it generates *beyond* the one person wearing it: how it is reappropriated and transformed by a community. Nothing to do with the traditional definition of "art in a museum". That's why I referred to Relational Art. What Vivienne Westwood and Malcolm McClaren did in the punk era could obviously be considered relational art from that standpoint, though not necessarily Westwood's work now. It's got nothing to do with a couturier's "artistic" aspirations either (cf Sorbier). Luca Turin called perfume "the most portable form of intelligence", but there's nothing to stop one from calling it "portable art". I have been thinking about just this matter very recently, as an artist making work using perfume as material, subject and site. You have expressed the argument so thoughtfully and elegantly, thank you. Minx, keep me informed... I'll be curious to see if there's anything in that direction at the FIAC (the perfumer Sandrine Videault did participate one year, and Christophe Laudamiel did some work with Orlan). Thank you! Your small analysis here seems to be a convincing argument for the relational view on art being very promising for understanding the "artness" of perfumery! Wish you a nice & fertile (intellectual, I mean :) dinner with B! But yes, I do think there's real matter for reflection here. I really enjoyed reading this article. Indeed, perfumery is a "portable art", and as time goes by, it gradually becomes a "portable life". And if it becomes a "portable life", then that also meshes in with Nicolas' theories of art as "invention of self"... But that's another book. On another note: Uella's comments (here and on your French post) about the importance of craftsmanship and technical skill in perfume-making are interesting, but I do feel that the same can be said of many non-functional art-forms: sculpture, musical composition and performance, and of course literature, all benefit from a basis of practical or technical skill, and many are affected by the quality of materials used. I am impatient with art-forms which divorce themselves from materiality and from the demands of technical expertise, so I really don't see that an 'artisanal' dimension invalidates perfume's legitimacy as an art-form. Parfymerad: you're right, several of the fine arts require fine-tuned technical skills, though I am probably less impatient than you with the works of art that don't: to me, the important thing is that it displaces our perception of what is shown, or of the world, or of the way we inhabit the world. So conceptual is fine with me! What a great post! I think the question of whether perfume is "art" is ripe for evolution. My sense is that we will find that there is no need to appeal to art or any likeness to art in order to validate fragrance. A similar effort was taken to validate photography as art in the sixties, with the realization that art is a broken category, as any postmodernist would say. The discourse around the "beautiful" died some time ago, for good reasons, so perhaps what we need on the one hand is a robust grasp of perfume as cultural production, and on the other, a new approach to the "beautiful" that aims to break perfume out of the myths (individuality, sexuality, personal identity) that have become naturalized parts of the conversation. My hesitation is that, as Bourriaud pointed out to you, that this implies an extension of the field of criticism (and its attendant problems, one presumes). The role and authority of the critic is still quite problematic in art world discourse, as I'm sure you know, and it would be horrible to see a nascent fragrance criticism seeking to be more academic or credible repeat these mistakes. How can we think fragrance differently, and in new categories? How can we build a conversation that is inclusive, robust, incisive, that enlarges the role of fragrance in culture, that enhances appreciation, that educates, that makes no claims to mastery, that establishes no canon, that does not rely on ekphrasis or emphaticism or bellelettrism...that is not subservient to the marketplace but, importantly, not naive to it either, that grasps the conditions of production, that can articulate fragrance's role in an expanded field, that can bridge the technical language of the perfumer with that of aesthetics, that identifies a user as well as a maker? What a wonderful challenge! Maybe the first place to start would be to look at how easily we fall into the habits of discussing single fragrances (as opposed to building genres), privileging fine fragrance (as opposed to consumer), ignoring the role of the evaluators and clients in determining finished work...We need to give fragrance a form of criticism it deserves, and that boldly works to hatch a new language and set of criteria for discussion. We wouldn't want to simply import the standards, subjectivities, and critical models of art history and map them over fragrance. Not would we want to have a perfume criticism that is more comparable to the art history of the 18th century--in its fixation on masterpieces, academy canon, the cult of the genius, hagiography, purple prose, and subjective pleasure. This would certainly be an extension of the field of criticism--in fact, a colonization of perfumery by criticism-- and would somehow make the world seem smaller! About beauty: this is actually, I think, the greatest hurdle to jump when attempting to think perfumery as a contemporary art form. While other arts have indeed ditched that particular notion, there’s no denying that perfumers want their work to “smell good”, if not to each and every person on the planet, at least to a sufficient number of people for their work to exist commercially. Even materials that don’t, by themselves, emit a smell thought of as pleasant by a majority in a given culture, are sublimated by their integration in a formula. However, it is certainly possible to inscribe the notion of what is beautiful within a cultural context; and I do agree with your point about perfume as cultural production. About the reliance on ekphrasis (i.e. on descriptions): this is actually the problem of a gigantic part of what passes for criticism nowadays, in every field. Most of it doesn’t commit itself and just goes about describing the work at hand. But I think in the case of perfume it can’t entirely be avoided because you can’t show it. Its invisibility requires an attempt to make sense of its notes, effects and structure through description for the reader to have any grasp of what’s being discussed. However, one of the points I was making in this post is that the very production of a sizeable body of writing/discussion, whether good or bad, relevant or solipsistic, is in and of itself more than an effect of perfume: it is part of it, through the community and alternate stories it generates. About ignoring the role of the evaluator, client, etc: I’ve been having an ongoing email discussion with a perfumer about perfume as an individual vs. collective work, and I would love to explore more in depth the contribution of artistic directors, for instance (whatever their job description may be). The opacity of the perfume industry makes this particularly difficult when you’re not an insider, and if you are, you don’t talk. Thinking about what you say of the 18th century type of criticism, I am reminded of what my teacher, the philosopher Jean-François Lyotard, used to tell us: for the most part, we are thinking our times with instruments that go back to the 19th century. When talking to “laypeople” about art, I usually find they use very classical criteria to understand it. And to conclude, something another one of my professors said, this time the philosopher Michel Serres: artists create the black box. Thinkers open it to shed some light. I don’t think a “lecture critique” needs to define itself as anything more, really. If you want to carry on this conversation, you know how to contact me!